Yet again the left-hand side entrance to Greenbank in Barnt Green is being used as a field. Cars parked at school drop-off and pick-up time use the opposite pavement. 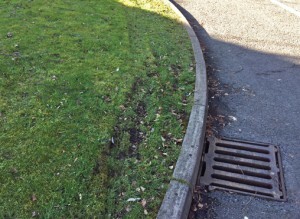 This then causes cars driving into and out of Greenbank to have to use the managed lawn area to enter and exit. This piece of land is managed by a resident and paid for by the resident. Could we ask, again, that people take a bit more care and consider where and how they park.